Russia lost control of the region in course of the World War I and, following the 1917 October Revolution, officially ceded it to the Central Powers by signing the 1918 treaty of Brest-Litovsk. In 1831, in the aftermath of the November Uprising, the Polish Army, the Constitution of the Kingdom of Poland, its parliament (Sejm) and local self-administration were disbanded. The constitution was replaced by the much less liberal and never fully implemented Organic Statute of the Kingdom of Poland. Also all universities were closed, and replaced several years later by purely Russian-language high schools. For a short time the territory maintained certain degree of autonomy. The former Kingdom of Poland continued to use the Polish currency (złoty) and the Administrative Council retained some of its privileges (although it was directly controlled by the Russian governor Field Marshal Ivan Paskevich). However, by 1832 the currency and the customs border were abolished, as was the metric system and the Polish penal code (which was replaced by the Russian penal code, de facto in use since the Uprising began). Also the Catholic Church was persecuted and most monasteries were closed and nationalized. In 1839, following the Synod of Polotsk, the Greek Catholic Church disbanded itself and united with the Russian Orthodox Church. After 1837 all voivodeships that constituted the Kingdom of Poland were turned into gubernias and became an integral part of Russian administrative division, ruled directly by the Russian tsars. After the January Uprising in 1863, the coat of arms of the Congress Kingdom was abandoned, the Polish language was banned from office and education and the process of incorporation of the Polish gubernias and Russification of its administration was completed. The 1867 reform, initiated after the failure of the January Uprising, was designed to tie the Kingdom of Poland more tightly to the administration structure of the Russian Empire. It divided larger governorates into smaller ones and introduced a new lower-level entity, gminas. There were 10 Governorates: five on the right bank of the Vistula River—Сувалкская (Suvalkskaya), Ломжинская (Lomzhinskaya), Плоцкая (Plotskaya), Седлецкая (Sedletskaya) and Люблинская (Lublinskaya)—and the remaining five on the left bank: Калишская (Kalishskaya), Варшавская (Varshavskaya), Петроковская (Petrokovskaya), Радомская (Radomskaya) and Келецкая (Keletskaya). The coat of arms of the Kingdom of Poland was abolished at this time. Despite the abolition of the Kingdom of Poland, the tsars of Russia retained the title "Tsar of Poland". The territory was a namestnichestvo until 1875 and later Governorate General, ruled by the Namestniks and Governor Generals of Poland. In the 1880s, the official language was changed to Russian, and Polish was banned both from official use and education. The name Vistula Land first appeared in official documents in 1888 although more recent scholarship traced it back to 1883. A minor reform of 1893 transferred some territory from the Płock and Łomża Governorates to Warsaw Governorate. A more extensive 1912 reform created a new governorate—Chełm Governorate (Kholmskaya Guberniya in Russian)—from parts of the Siedlce and Lublin Governorates. However this was split off from the Privislinsky Krai and made part of the Southwestern Krai of the Russian Empire, in order to facilitate its russification. In 1915 during World War I the retreating Russian army looted and abandoned the Kingdom of Poland, trying to emulate the scorched-earth policy adopted during the 1812 invasion. The Russians also evicted and deported hundreds of thousands of the area's inhabitants whom they suspected of collaborating with the enemy. As the Russians retreated, the Central Powers occupied the area (1915); subsequently they proposed the establishment of the Kingdom of Poland (1916–1918). 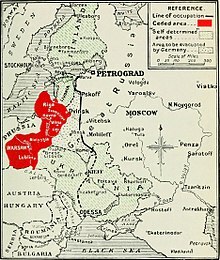 In the March 1918 Treaty of Brest-Litovsk, Russia (by then embroiled in a civil war), effectively ceded all Polish territories it had formerly possessed to the German Empire and Austria-Hungary. (in English) Despite the introduction of the official name Vistula Land, terms such as, Kingdom of Poland, Congress Poland, or in short Kongresówka were still in use, both in everyday language and in some publications. (in Polish) "Królestwo Polskie po powstaniu styczniowym: Nazwę Królestwa Polskiego zastąpiła, w urzędowej terminologii, nazwa Kraj Przywiślański." [...] "Po rewolucji 1905-1907 w Królestwie Polskim ..." [...] "W latach 1914-1916 Królestwo Polskie stało się...". (in English) "Kingdom of Poland after the January Uprising: the name Kingdom of Poland was replaced, in official documents, by the name of Vistula land." However the same article also inconsistently states: "After the revolution 1905-1907 in the Kingdom of Poland" and "In the years 1914-1916 the Kingdom of Poland became...". ^ Andrzej Szwarc. Od Wielopolskiego do Stronnictwa Polityki Realnej zwolennicy ugody z Rosją, ich poglądy i próby działalności politycznej (1864-1905). Warszawa: Wydział Historyczny UW, 1990, pp. 208-209. This page was last edited on 4 March 2019, at 02:50 (UTC).